The T-Handle Strongback system has only three moving parts to secure the hatch cover to the deck. Like the Classic HEX it is simple, strong, reliably watertight, infinitely adjustable from topside, and easily serviced (parts are readily available and replaced in the field). 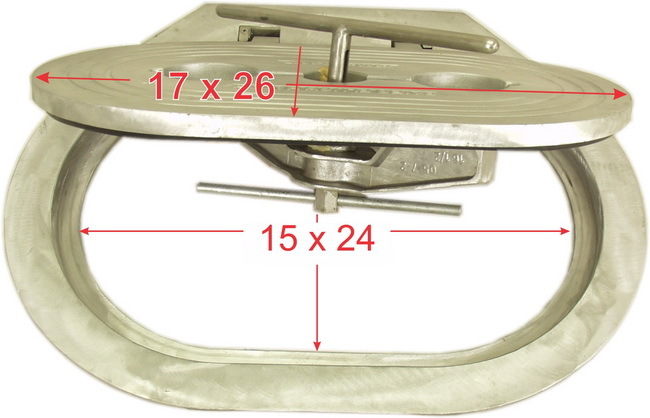 The T-Handle Strongback hatch cover product line is available only in cast aluminum. The deck rings used are the same as the Classic HEX and are available in galvanized mild steel (for welding into steel decks), or cast aluminum (for welding into aluminum decks or bolting to fiberglass or wood decks). Stainless deck rings are available by special order. The design is especially popular on aluminum boats, fishing and other workboats, as well as many U.S. Navy and U.S. and Canadian Coast Guard vessels.